What started out as a mellow evening quickly became a night filled with pandemonium. 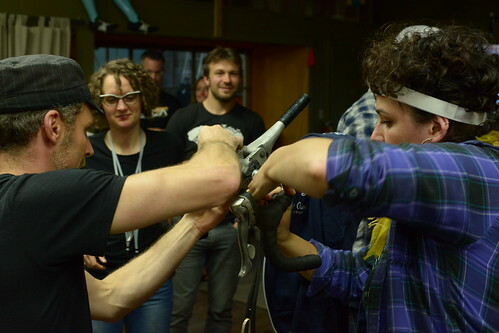 The Bike Mechanic Challenge was in full force Saturday night at Velo Cult. 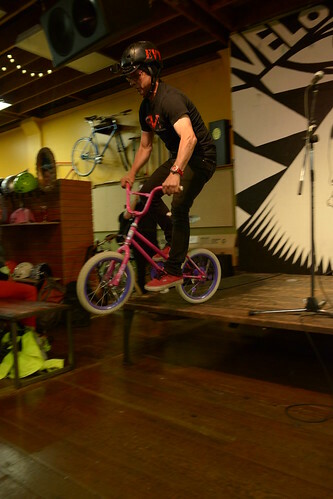 At the helm was Brett Flemming—owner of Efficient Velo Tools—our fearless emcee who led 10 bike shops and 20 mechanics through a series of four competitions to determine Portland’s best bike mechanic. Audience members cheered and heckled participants through four rounds of competition: front and rear cable change, flat tire repair while blind folded, drop bar taping, and putting together a “mystery object”, which turned out to be 10 bikes destined for deserving children through the Community Cycling Center’s programs. To ensure the winning bike was properly rebuilt, Flemming jumped it from the stage in front of an enthusiastic audience. 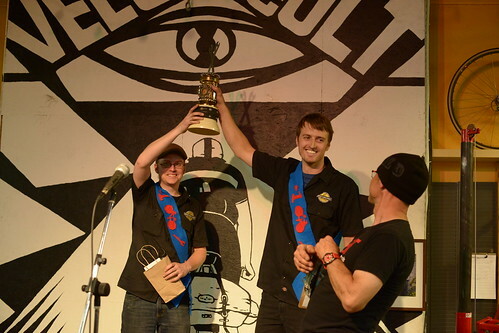 The people’s choice for best bar taping went to City Bikes. Not only do they know how to dress drop bars, but they also know how to dress their wounds. Both mechanics were recovering from surgeries, but still held their own. Portland Design Works, one of the lead sponsors of the event, made sure each mechanic stayed well hydrated by buying a round of beer. Good timing on their part. It looked like it really helped their performance during challenge #3: changing a flat tire while blindfolded. 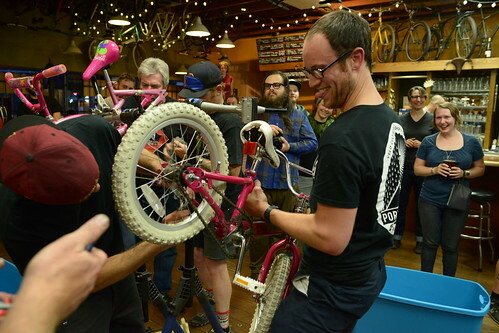 All in all, the event raised over $11,000 for the Community Cycling Center and honored the hardest working people in Portland’s bike industry. See you next year! Rest assured, we’ll be bringing back some secret surprise twists and you may see the return of the blindfolds. 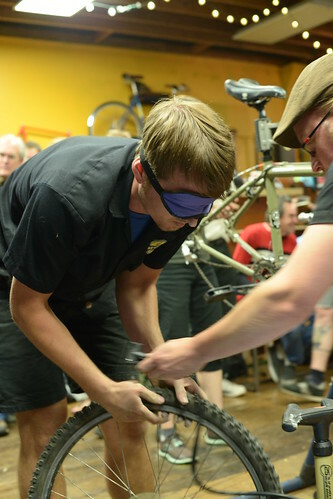 To see more photos from the Bike Mechanic Challenge, visit our album on Facebook.